As a family, we love entertaining guests. Call it the Sequeira genes or the Indian ethos of “Atithi Devo Bhava” (Where guest is god), we are happiest when we have guests, friends or family come over. The fact that near about all the family stays within a few blocks of each other also helps. So, really we don’t need an occasion to congregate somewhere and start the banter. After all, isn’t life made up of all these small yet very precious moments? Now, usually when we have guests coming over, I prefer making something light and that gets done quickly, this way I have more time to spend with my guest. So the other day when we had a few guest coming over from Mangalore, the menu was set, Fish Cutlets and Crispy Fried Squid for starters, Kheema Kofta Pulao for the main course and Mango and cottage Cheese snowballs in Custard Sauce for desserts. Long list right? Trust me, my guests more than expect a kings spread by now. I promise I’ll put the recipes shortly. As for today, the dish is question is the Kheema Kofta Pulao. Honestly, not something new and may be you would have tasted it at some point in time. A Mughlai dish heavily spiced and oozing with oil and ghee. Considering the Mumbai heat and the fact that my guest don’t really like spicy food, my notes for the revised recipe went something like this, mince, hint of cheese, lightly flavored with spice, whole spices in rice, cook, add koftas.. done. The idea was not giving one big burst of flavour, but to try and marry a couple of flavours and bring them to gether. This turned out to be an nice fragrant, superbly flavored, not heavy but good enough to satiate. My guest lapped it up with élan and so did the two taste queens, which made me feel I have passed the test. The best compliment always comes from them right? What is good about the recipe is that though is a not the original version, it comes as close to the original in terms of the flavour. My guest did enjoy the spread. We enjoyed the time we spent with them, memories of which we will cherish for long. After all, like the famous ad slogan says “There are something’s money can’t buy”. Family is one such thing! Combine all ingredients for the kofta; except the oil for frying. Roll the mince into small spheres and keep aside. Once done, fry the koftas on a medium heat till they get a light reddish colour. I used chicken mince, so mine got done in about 7 mins a batch. The cooking time may be more or less depending on the quality and kind of meat you use. Take out and drain the oil using an absorbent paper. Try not to skip the cheese in the koftas since the melted cheese gives a nice coat to the koftas and also prevents it from moisture loss. Do not over cook the koftas, they may turn dry and hard. When the onions start to brown, take out and keep aside on an absorbent paper. Meanwhile, wash rice with several changes of water till the water is clear. In a large vessel, add oil, and the whole spices. Add the water, salt and give it a gentle mix and allow it to cook on medium heat for 8-10 minutes. The time may differ depending on the rice. Once most of the water has evaporated, reduce the heat to low and allow to cook for about 2 more minutes. At this point there will be almost no water left in the rice. Switch off the heat. Sprinkle the milk with saffron and give it a light mix. Be careful not to break the grains of rice while mixing. Cover the vessel and let it rest for some time. Remember the cooking process is on since the steam will cook the rice some more. After about 10 minutes, remove the lid and add the koftas, mint, coriander, nuts and once again give it a mix gently. Just before serving drizzle the lemon juice and the remainder of the caramelised onions. 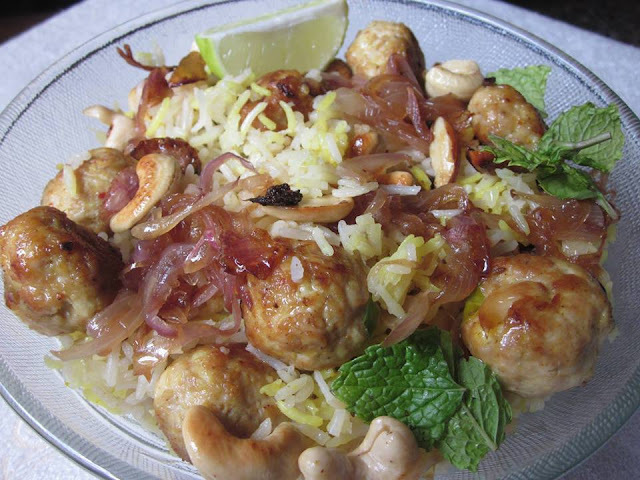 Fragrant, aromatic and bursting with subtle flavours, Kheema Kofta Pulao is ready to serve. Savor each bite!! !